Is it really okay for the Taoiseach [Irish prime minister] to do what he did, then he makes a non-apology and everyone moves on? Did Enda Kenny lie to us? You won’t find a straightforward statement in which he said he had nothing to do with the stroke. Instead, he said, “ministers are free to make nominations to particular boards”. Sleeveen language. Deliberately deceptive, while taking pains not to formally lie. A sleeveen is a sly, smooth-tongued person, a rogue or a trickster. Oxford Dictionaries defines it as ‘an untrustworthy or cunning person’, Collins says it refers to ‘a sly obsequious smooth-tongued person’, while Yeats glossed it as a ‘mean fellow’. You get the idea. Despite appearances it can be used affectionately, like most Irish insults, but this is obviously not the case above, nor is it normally. Slíbhín may derive from sliabh, Irish for ‘mountain’, plus the diminutive suffix -ín, however unfair this seems to small mountain-dwellers. Sliabh is the etymon proposed by most of the reference works I checked. The roots of sliabh lie in physical geography. MacBain’s Etymological Dictionary of the Gaelic Language ties it to sleamhuinn ‘slippery, smooth’, and compares it with English slope and slip (cf. the Proto-Indo-European root *sleubh– ‘to slide, slip’, source of the sleeve into which we slip our arm). P. W. Joyce, in English As We Speak It In Ireland (1910), offers the etymology slígh ‘a way’ + bin ‘sweet, melodious’: a sweet-mannered fellow. To this description he adds smooth-tongued, sly, and guileful, and says sleeveen is ‘universal all over the South and Middle’. He is a parish pump shleeveen of the worst sort. A man who will do and say anything to keep his seat. This is the first time I’ve received any sort of invitation to a political fundraiser, and it turns out to be in aid of the aspirations of a catholic, sleeveen, poisonous asp. Lets see how well the arrogant Irish sleeveen publicans who have taken their customers for granted for so long deal with this one. Sneaky self promoting shleeveen he definitely is. He struck me as being the Dáil 2.0 style of parish pump, sleeveen politician. ‘That fellow’s a sleeveen,’ he said. It was a pejorative word meaning a little mountainy fellow, as treacherous as he was unpredictable. Sleeveen also has dialectal currency in Canada. The Dictionary of Newfoundland English has several entries under various spellings, including sleeveen as a verb meaning ‘steal’. Its main entry has assorted definitions and examples. This entry was posted on Wednesday, October 1st, 2014 at 3:33 pm and is filed under dialect, etymology, Hiberno-English, Ireland, language, words. You can follow any responses to this entry through the RSS 2.0 feed. You can leave a response, or trackback from your own site. Perfect word for a few too many vendors I’ve hired recently. You’ve inspired a post! Wonderful, I love that term. Interesting. I wonder if knowledge of this Irish word influenced the creation of the Doctor Who aliens the Slitheen, who disguised themselves in their initial appearance as politicians and for whom sly, cunning, untrustworthy and guileful would be appropriate descriptions. My Little Nanny Redmond used to refer to people she didn’t trust as ‘that little sleeveen’. prepwise: Bad news, good news. At least you have a new word for them! Patrick: An interesting idea, but I’d be surprised if there were a direct connection. 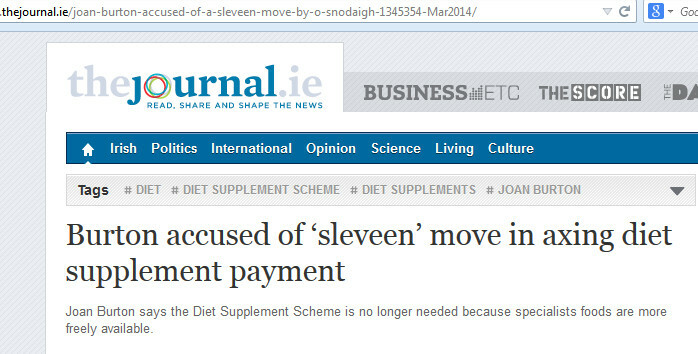 Sleeveen isn’t well known outside Irish and Canadian dialects. Slitheen uses the same sound symbolism underlying e.g. slither – and Slytherin from Harry Potter, which seems a more likely influence. Michelle: Ah, excellent. It’s a very expressive put-down. with attested usages of “smooth, sleek, flat, unleavened bread, slippery, deceitful, sly, quarrelsome”. Used in several obscure Irish poems/texts with mixed middle and modern Irish c.100-1800AD, but two in particular are 17thC, so probably no earlier than 16th C.
Vox: That’s helpful, thanks, and it sounds like a plausible path. Newfoundland hockey players are pretty easy to stump. To be fair, the hockey players aren’t actually from Newfoundland – they just play there (hence the fun exercise of having them try to guess at the meanings of local words). It is a common word among people native to Newfoundland. And there was me thinking it was where Napoleon kept his armíní. Oisín: He always kept reserve forces up his sleevíní. What a fascinating/frustrating (frustinating?) etymological quest! We’re really lacking a proper etymological dictionary of Modern Irish, although McBain can be a good start. Maybe the Foclóir na Nua-Ghaeilge project in the Royal Irish Academy will be including etymological information in their dictionary, but I’m not sure about that. I’d have my doubts about slim, though. I don’t think it has the lenited /v/ sound; we can tell this from words it rhymes with and also from the Modern Irish spelling (slim), and some medieval spellings have it as slimm which points to the same thing. 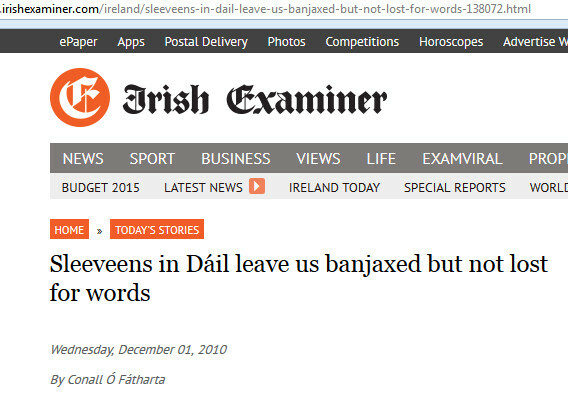 The derivation from sliabh + -ín seems to work best linguistically, although we mightn’t like the insinuation. Although the diminutive suffix usually indicates affection or smallness in a physical sense, it could also suggest meanness, pettiness, lowness or contempt, as in ‘Shoneen’ or ‘Jackeen’, I suppose. There are a few places called Sleveen (an Sléibhín; presumably also from sliabh + -ín), mostly around the south; I wonder could it have come from some unhappy association with one of these places? Maybe something like the way ‘culchie’ is said to come from Coillte Mach? Hi Clodagh, thanks for your very constructive thoughts on this. The lack of a good etymological dictionary of modern Irish is sadly true. I like MacBain’s but it’s obviously not ideal for contemporary searches, etc. As for the true origins of slíbhín, I would only be guessing, and guessing amateurishly at that. But the possibility that it derives from a particular place or place name is interesting, and seems plausible. I’ll try to do a post on culchie at some point.